Thursday night: Rain, heavy at times. Lows around 40. Friday: Mostly cloudy with sprinkles, gusty Cape wind early, mountain snow. Highs in the 40s. Saturday: Windy, cooler. Chance for snow showers early. Clearing PM. Highs in the 40s. Sunday: Sunny. Highs in the 50s. A coastal storm is slowly making its way into New England. 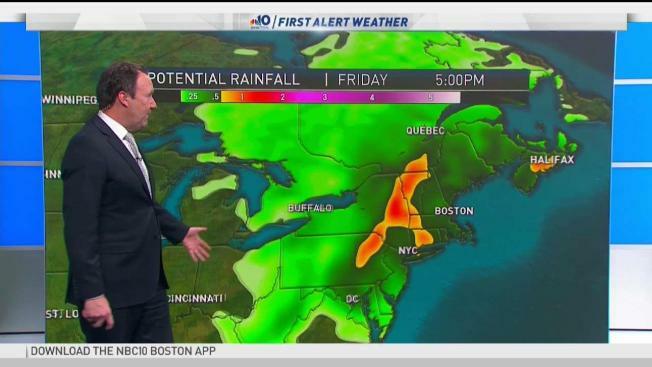 Our best chance for heavy rain will be between 11 p.m. Thursday and 6 a.m. Friday for Boston. Rain spreads south to north overnight and things dry off from the downpours during the morning drive. Heavy pockets of rain will sweep through overnight with rain so heavy it may wake you up. There is a chance for a rumble of thunder, but otherwise the heavy rain and gusty wind will be the threats through Friday morning. Lingering spotty showers and drizzle as well as some fog will stick around Friday afternoon. The rain changes over to a few light flurries Friday into Saturday as colder air drains in. Mountain areas in northern New England will see snow from Friday through Saturday. We expect 6-12 inches of snowfall in higher terrain, a coating to 2 inches of snow in the Worcester Hills possible early Saturday only, and around 1 inch of rainfall through Friday for southern New England. The heavy and pasty snow consistency in higher terrain areas will bring a threat for some outages or damage, combined with the gusty wind Friday morning and again Saturday afternoon. Gusty east, southeast wind will howl overnight through Friday morning between 40 and 50 mph. Wind subsides a tad by late morning to 20-30 mph and by afternoon the center of the low passes overhead, allowing for a light breeze. Wind ramps up again behind the low pressure center Friday evening to 20-40 mph west gusts. Wind remains strong through Saturday afternoon, peak winds 40-50 mph from the west, northwest. Higher gusts are expected in the mountains. Our tides are astronomically high again Friday around 1 p.m. so we expect pockets of minor flooding and some splashover. The wind turns offshore right around the time of high tide with wave heights 10-15 feet way offshore. Saturday will be windy as the low pressure system pulls away. Wind gusts from the west, northwest could be between 40 and 50 mph. Temperatures cool to the mid-40s with late day sun Saturday, there's also a chance for a flurry or two before clearing skies late in the day. High pressure builds in for Sunday, making that the pick of the weekend with sunshine and highs in the mid-50s. Highs will be in the low 50s on Monday, with increasing clouds as a cold front dips southward. This triggers a few showers, to light snow overnight into Tuesday. Colder air takes over Tuesday afternoon with highs only in the upper 30s. Quiet weather takes over for the end of the work-week. Wednesday will be sunny with highs in the low 40s, nearing Thursday with thin clouds. Friday we jump into the low 60s! Spring fling all throughout this 10-day forecast and we continue the warmer forecast into the next weekend while some areas may make a run at 70, rain late Saturday.